Jonelle Price and Classic Moet give the people exactly what the want – speed and sass for days. Photo by Nico Morgan Media. “She’s some mare,” said Jonelle Price after her blazing fast round on Classic Moet. And some mare she most certainly is – statistically the fastest in the field, ‘Molly’ was the horse that everyone was looking at to try to make the optimum time. 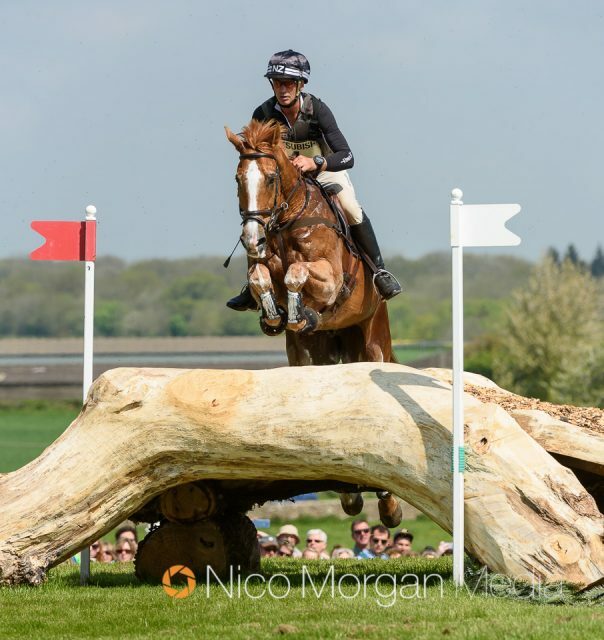 She didn’t, quite – she finished just a second over, to add 0.4 penalties – but on a day in which the average time penalties worked out at a whopping 25.3, this was no mean feat. 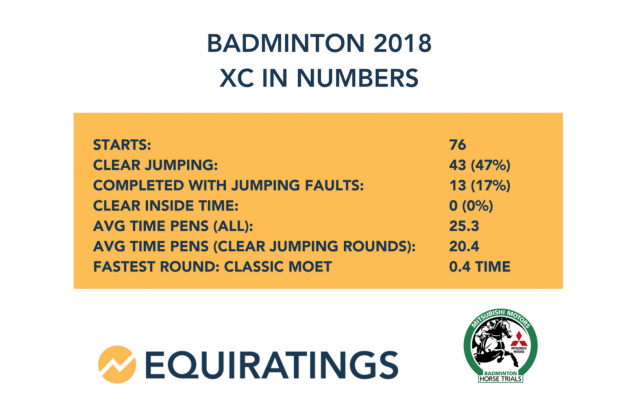 To give you a sense of scale, the average expected time penalties at Badminton over the past ten years – including the last wet year in 2014 – is 15.1. 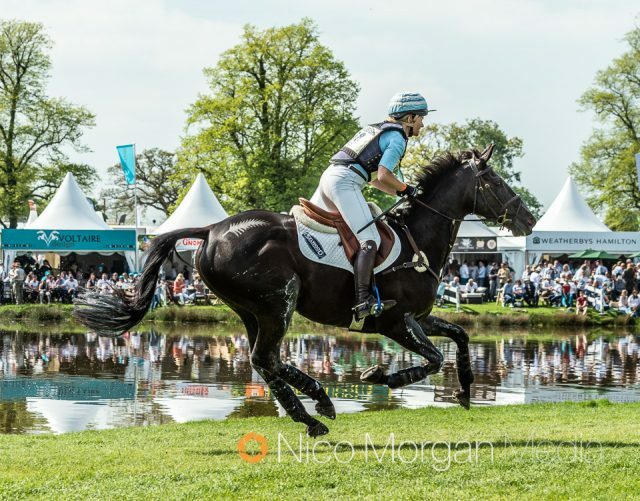 As predicted, the time was the main factor throughout the competition, which almost every combination posting slower-than-average times and several prominent pairs coming to grief in the influential middle of the course. The ground proved difficult, too, although it defied expectations by improving marginally throughout the day. In a dramatic change of tone the sun, too, made an appearance, with the still heat causing horses to tire more quickly. None of these factors seemed to affect Classic Moet. This is Jonelle’s first full season of competition back after taking break to have baby Otis, and while she was out, ‘Molly’, too, took a break. Anticipation of some rustiness lead to Jonelle changing her plan at the Lake, going long after an uncomfortable jump at the B element and putting herself down on the clock. 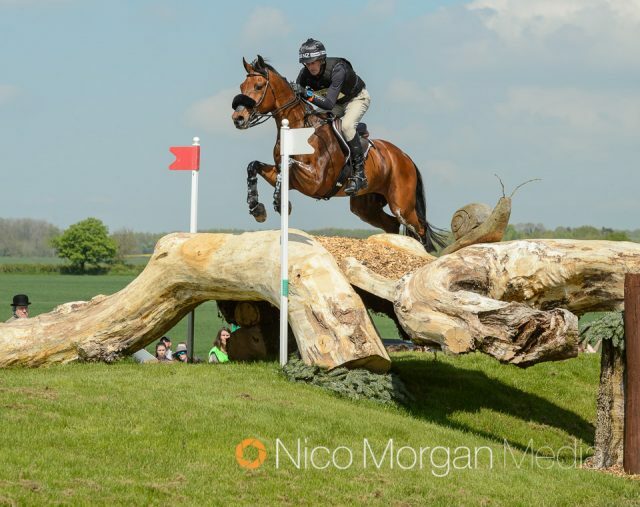 Dressage leaders Oliver Townend and Ballaghmor Class slide into second place on a technicality of scoring. Photo by Nico Morgan Media. 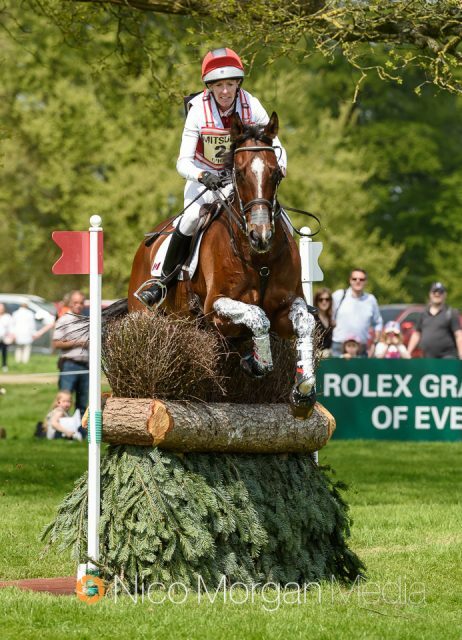 Dressage leaders Oliver Townend and Ballaghmor Class came in at 18 seconds over the optimum time, putting them on the same score as Jonelle and Classic Moet but moving them into second place, as tie-breaking at this stage is decided by proximity to the time. 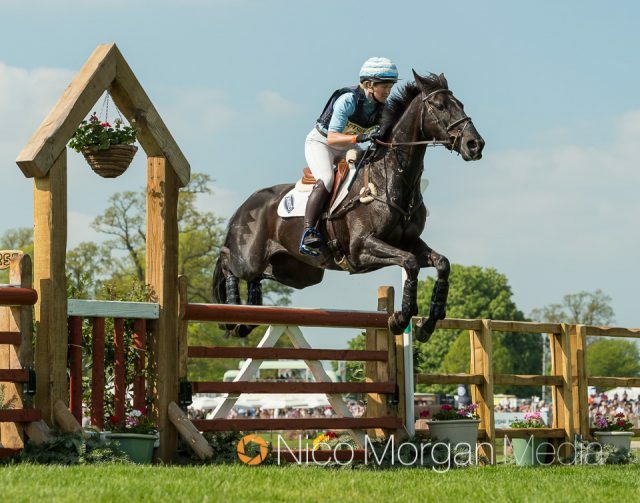 The Burghley-winning horse looked as though he tired considerably in the latter third of the course, but he continued to jump well, putting Oliver in the strong position of having two horses in the top five. Both Ballaghmor Class and his earlier ride, Cooley SRS, added 7.2 time penalties to their dressage scores. Talk about consistency. 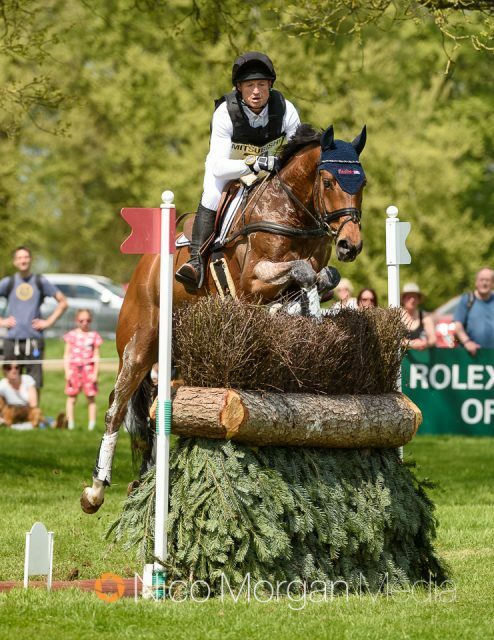 Fifth-placed Cooley SRS and Oliver Townend. Photo by Nico Morgan Media. First-day dressage leader Ros Canter and Allstar B impressed again today, adding 6.4 time penalties to their first-phase score of 30.3 to sit third going into tomorrow’s competition. 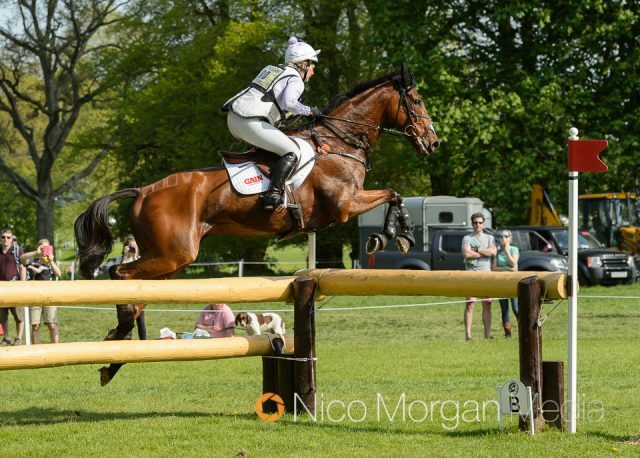 Ros Canter and Allstar B dig deep to keep themselves in a competitive position. Photo by Nico Morgan Media. Michael Jung and La Biosthetique Sam FBW show their class once again. Photo by Nico Morgan Media. 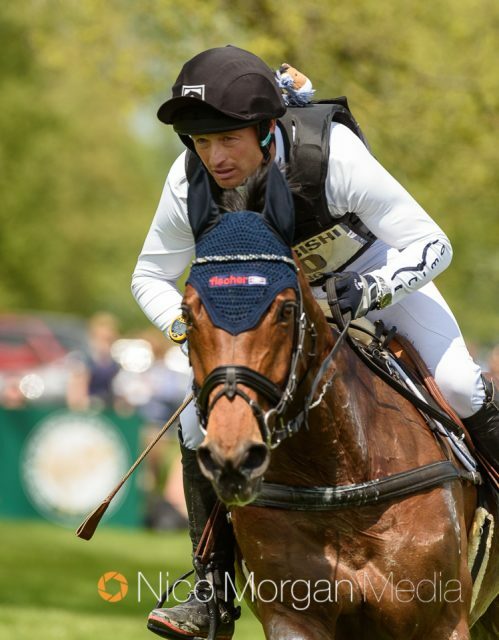 Fourth place overnight is held by former winners Michael Jung and La Biosthetique Sam FBW, in what is projected to be the horse’s final Badminton. They produced one of the fastest rounds of the day, adding just 2.7 time penalties, despite an uncharacteristic wobble at the Outlander PHEV Mound, where the horse left a leg. It was Sam’s consistency, and his relationship with Michael, that allowed them to push on and catch up on lost time. Mark Todd and his second ride of the day, Kiltubrid Rhapsody. Photo by Nico Morgan Media. Mark Todd was another rider to finish the day with two horses in the top ten, holding sixth place with Kiltubrid Rhapsody and tenth place with Leonidas II. Mark Todd and Leonidas II. Photo by Nico Morgan Media. 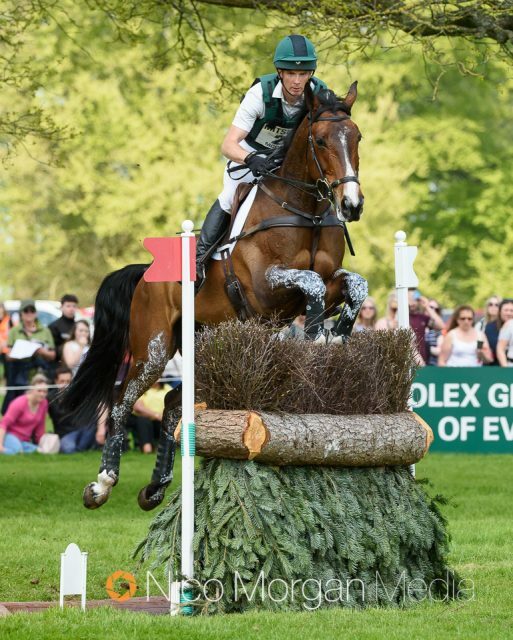 In both rides, Mark had a close call at the Savills Escalator, but managed to avoid his bad luck of Burghley last year, in which he fell from Leonidas after the horse stumbled on landing in a combination. Lauren Kieffer and Veronica prove that they can ride to the clock. Photo by Nico Morgan Media. Lauren Kieffer and Veronica defeated their demons of last year, in which accumulated time penalties knocked them out of contention for a top spot, by adding just 14 seconds on the course. They sit in 7th place going into showjumping. Arctic Soul and Gemma Tattersall speed around the course. Photo by Nico Morgan Media. Gemma Tattersall and Arctic Soul climbed from 35th to 8th place after an incredibly quick round put just 4.4 time penalties on their tally. The Thoroughbred horse was one of the favourites to produce a fast clear, and he didn’t disappoint. Padraig McCarthy and Mr Chunk tick a big box. Photo by Nico Morgan Media. Ireland’s Padraig McCarthy may have contested Rio, but he’d never competed at a true four-star. Today, he ticked that box with Mr Chunky, finishing the day in 9th place. 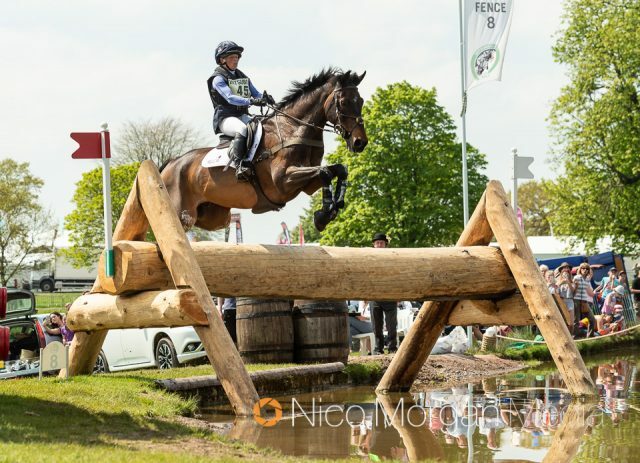 Padraig credits wife Lucy, nee Weigersma, for producing the horse and providing the support that has allowed him to climb to such a lofty height since switching from showjumping to eventing in 2013. Selena O’Hanlon and Foxwood High make light work of Badminton. Photo by Nico Morgan Media. 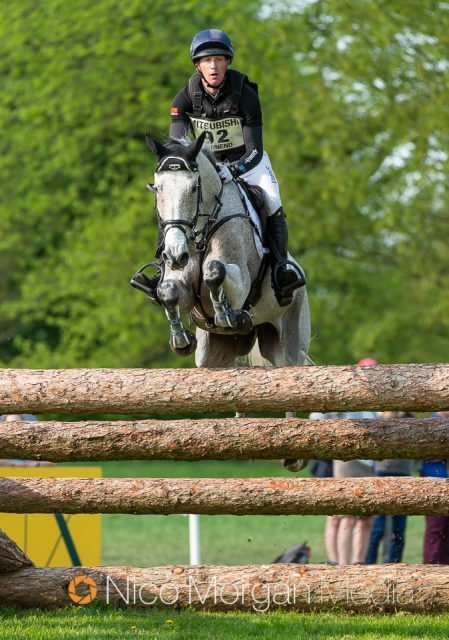 Selena O’Hanlon and Foxwood High helped realise a long-held dream for owners John and Judy Rumble when they went clear today, adding 16.4 time penalties to sit in 17th place overnight. “He loved it – he took me everywhere and his ears were pricked the whole time. I made things a bit more difficult a couple of times – I made some angles too difficult but he just listened to every tug of my reins or kick I gave him,” Selena said. 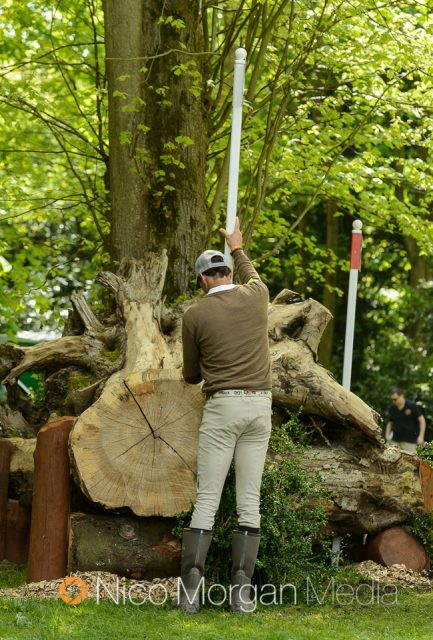 Will Coleman makes himself useful before his round. You’re welcome. Photo by Nico Morgan Media. We were sorry to see Madeline Backus and PS Arianna fell at the last element of the Lake, but were up and walking away within seconds. Will Coleman and OBOS O’Reilly came to grief at this question too, running out at the final element before retiring. Paulank Brockagh shows her reliability in difficult conditions, sitting in 11th overnight with Sam Griffiths. Photo by Nico Morgan Media. The Lake at 9ABC proved the most influential effort on course, with eight pairs faulting at some point in the combination. 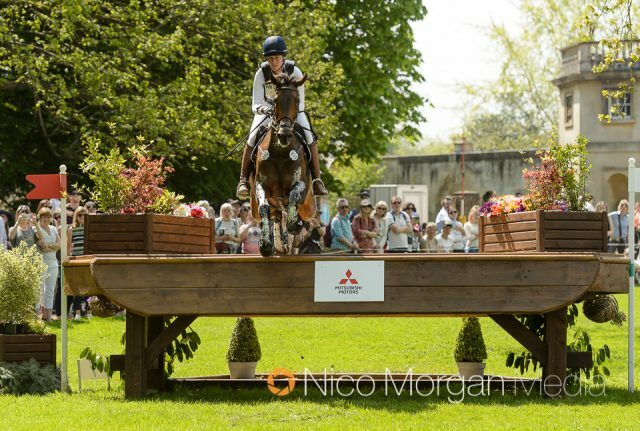 Huntsman’s Close, the second combination on course, saw six pairs rack up costly errors. Fan favourites Piggy French and Vanir Kamira, as well as Jonty Evans and Cooley Rorkes Drift, began the day in the top ten but each suffered elimination – Piggy fell at the Hildon Water Pond, and Jonty dismounted and retired after Cooley Rorkes Drift misjudged the final element of the Eclipse Cross Pond, ending up stick between the front and back bars of the wide oxer. 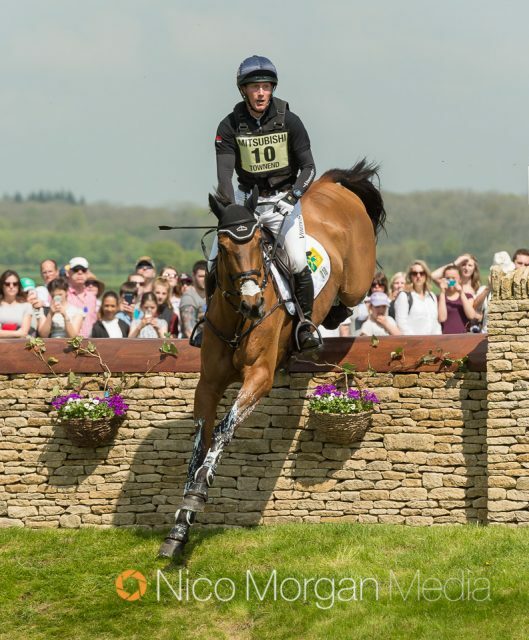 It was confirmed at the end of competition that Oliver Townend had received a yellow card from the FEI. We’ll bring you the story shortly. We were also devastated to learn that Alex Bragg‘s talented Redpath Ransom suffered a catastrophic suspensory injury whilst galloping between fences 27 and 28 and was subsequently euthanised. Our condolences to all of this wonderful horse’s connections. 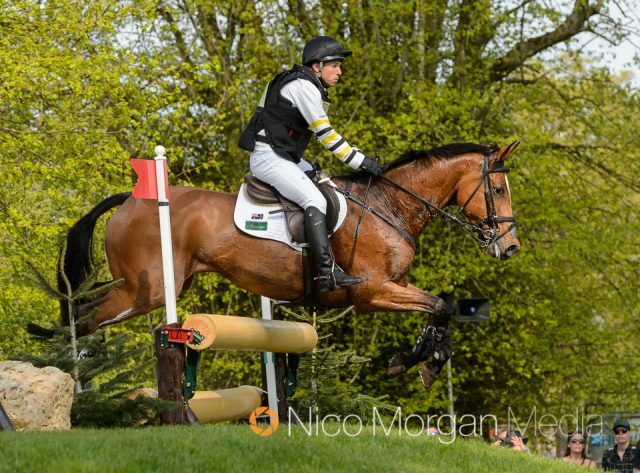 Nereo and Andrew Nicholson record an early fast round, adding 7.2 time penalties to sit 12th. Photo by Nico Morgan Media. 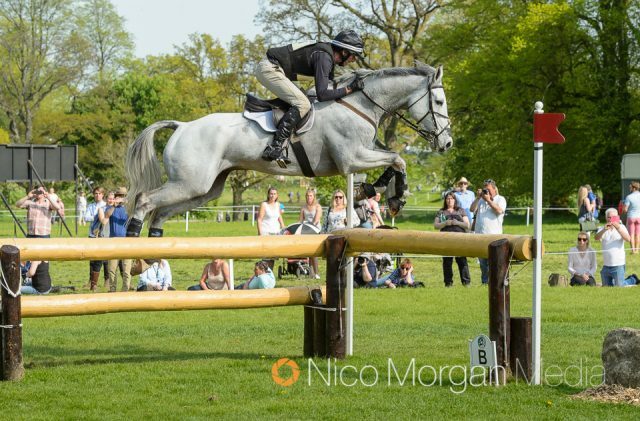 We’ll be taking a look tomorrow morning at how the best-placed riders might fare going in the final phase, as well as bringing you everything you need to know from the final horse inspection. How the day played out in numbers, courtesy of the statistical whizzkids at EquiRatings. The top ten at Badminton going into the final day.